Paradise awaits you in this new luxurious, three bedroom three bath 2500 sq.ft. 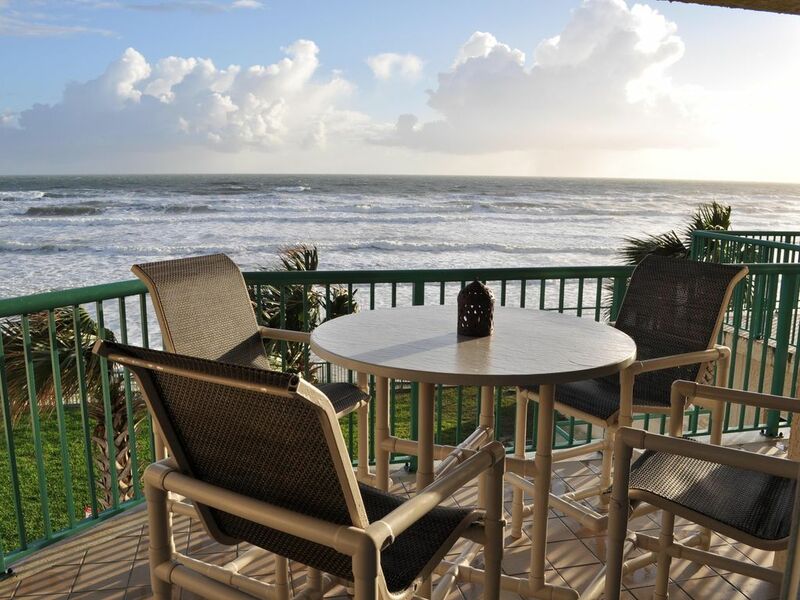 direct oceanfront condo located on the beautiful beaches of Daytona Beach Shores. Enjoy panoramic views of the worlds most famous beach while sitting in the grand living room, dining room or master suite. Large master suite features king bed, spectacular private master bath with jacuzzi tub and walk-in glass block shower and spacious balcony. Second bedroom features queen bed, walk-in closet and full bath. Third bedroom features two twin beds, full private bath and portable pack-n-play. The spacious kitchen is fully equipped for all of your cooking needs. From the breakfast nook to the island with counter bar, you will enjoy this gourmet style kitchen. After a day at the beach, enjoy amazing ocean views from the comforts of the living room. Enjoy watching TV on the Bose home entertainment system or relaxing on the oversized oceanfront balcony. Building features secured entrance, garage parking, oceanfront hospitality room with fitness center, bar area, big screen TV, pool and Jacuzzi. This wonderful condo has been our favorite vacation spot for the past few years and we hope to visit again this fall. It is clean, quiet, beautifully decorated and we did enjoy the upgrades since the last stay. During the stay, we had a small problem with the refrigerator and owner was quick to respond and made sure that the problem was resolved ASAP. Love being right on the beach and the underground parking. Very safe and secured property. The condo was amazing and very well decorated. Loved being right on the ocean. It was so clean and very well kept. We enjoyed it so much, we already booked for March 2017. My wife and I came down to Daytona Beach Shore in 2014 to be married and stayed here in this condo. Very nice. Very clean. This place is definitely on our list of places to stay when we come to the area. The condo was beautiful and very well decorated (the nicest that we've ever stayed at). It felt like home. It was clean and very well kept. We really enjoyed our stay and plan to stay here again. We thoroughly enjoyed our stay at this beautiful condo. The condo was much nicer than the pictures conveyed. The kitchen was very well equipped as was the in condo laundry room. The abundance of linens was a luxury. The view from the balcony was beautiful and we enjoyed it every morning while having coffee and breakfast. There was nothing we needed that was not there. The building was first class. The parking space is conveniently located to the stairs and elevator. We used the well equipped exercise room. We would recommend this condo to friends/relatives, and would rent again from this owner. We have stayed here at least five times, and each time has been as enjoyable as the first. Would definitely recommend. Our family has always been impressed with the "homey" feeling and the abundance of linens and towels. My grandchildren liked that there were fishing poles, as well as other water needs. No need to even take your beach chairs. Everything is kept immaculate. Certainly should give this condo a try.